From an apples and pumpkins theme to Halloween, these free printable pumpkin alphabet cards have so many uses in your preschool classroom! Today I’m offering five literacy activities you can add to your fall lesson plans using this single set of pumpkin alphabet cards. That’s right! These are free printable pumpkin alphabet cards, so be sure to grab your set at the end of this post! It’s not really fall yet where I live. It’s basically still summer except that it’s starting to get a tab chilly after the sun sets. A few maples are just beginning to turn around the edges, but otherwise, it’s still summer. But it’s not summer in the stores where the shelves are already infiltrated by autumn decor, which honestly, makes me smile. And I’ll also admit that right now, as I talk to you, there are multiple sets of mini pumpkins and decorative gourds in my online grocery order ready to be picked up tomorrow. And my little boys can’t wait for fall, either. So when we wondered through Walmart the other day in search of some back-to-school folders we forgot to grab a month ago, they were delighted, no, practically overjoyed, to see the school supplies shoved into clearance bins and the seasonal shelves overtaken by silk leaf garlands, paper mache pumpkins, and wooden “It’s fall, y’all” signs. 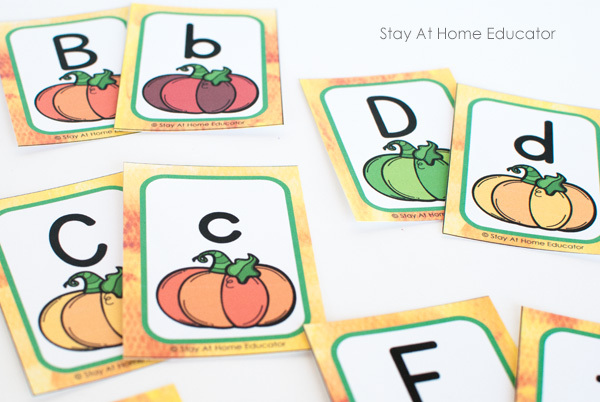 My boys can’t wait for our own fall and apple and pumpkins lessons in school, which is just one reason these printable pumpkin alphabet cards are so handy. They came about in a rather timely way. While it’s still warm enough for shorts and tank tops, we’re over summer and enjoying all things pumpkins. These pumpkin alphabet cards are so versatile! So many fun ways to use them. Here I am sharing with you five literacy activities to do with these cards, but honestly, I might lose count and give you a few more since we’ve enjoyed them so much! I’d love to hear your ideas for these cards in the comments, too. Traditional Memory – Students love the challenge of remembering where the right pumpkin is. The first go around, my little boys and I matched the letters on the cards. This makes the best review, especially if you separate out the familiar letters and just use those. Pumpkin Colors Memory – While the letters on the cards match, the colors of the pumpkins do not. 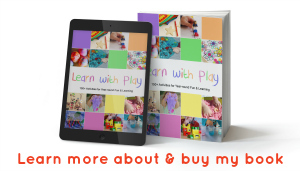 These cards include all the rainbow colors as well as brown and gray, so they’re perfect for teaching little ones colors. The next day, my little boys and I practiced matching the letters on the cards with our letter manipulatives. 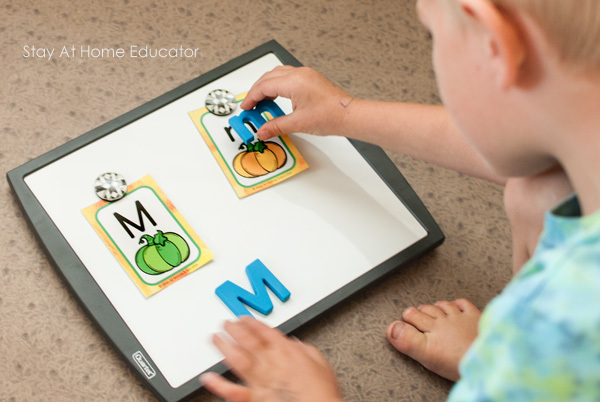 The ones in the picture are magnetic, which make them all the more fun, but you can use wooden letters or foam letters, too! 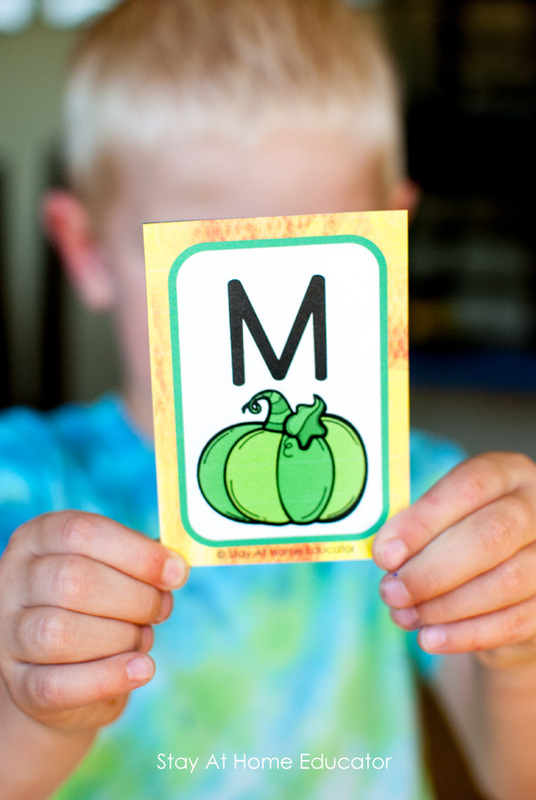 You can give your preschooler extra matching practice by inviting them to first find the letter matches on the pumpkin cards followed by matching the letter manipulative. This is great letter identification practice! Now, I mentioned that these pumpkin alphabet cards have a variety of pumpkin colors, right? Let’s talk about how to extend that color recognition practice. Sort all the pumpkin alphabet cards by color. Find familiar objects from a set that match colors. Search the room for matching colors. What does this have to do with literacy, you ask? 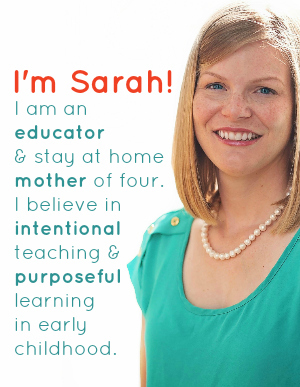 I agree, matching colors is more of a math skill, but it also helps train the eye to see differences, which is so important to learn how to read! I’ve talked about the importance of visual discrimination many times before. 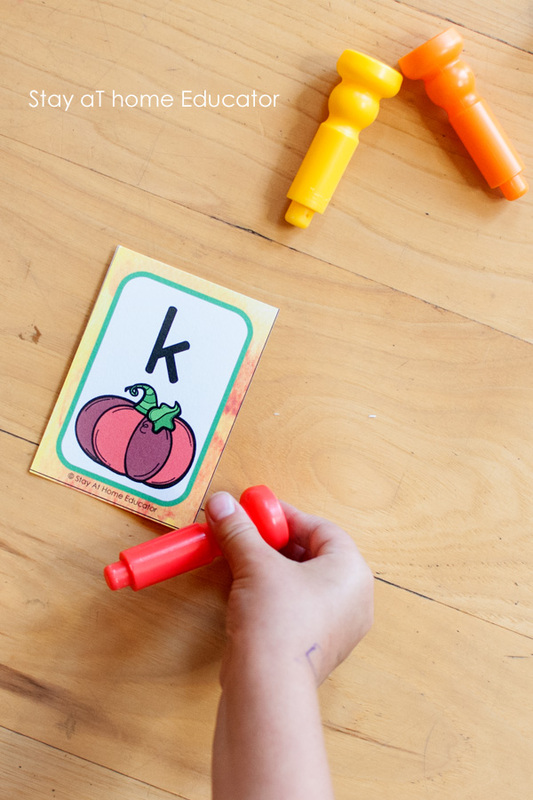 Now, this is easily our favorite literacy game we made up for these pumpkin alphabet cards. I separated the cards so that I had two complete sets of letters in two piles. I hand-selected 6-10 letters to tape onto the wall, and then had my little boys stand on the opposite side of the room from said wall. Then, when I flashed a card (from the second pile of letters) the boys quickly identified it, and then raced to slap the matching card on the wall. Another game we like to play is to scatter one set among the room and “seek” them out. I give a pumpkin alphabet card from the second set to one of the boys and he has to search around the room for the matching card. Bonus if the matching card is next to something that has the same beginning sound, and extra bonus if your little one can name one more thing that starts with that sound! 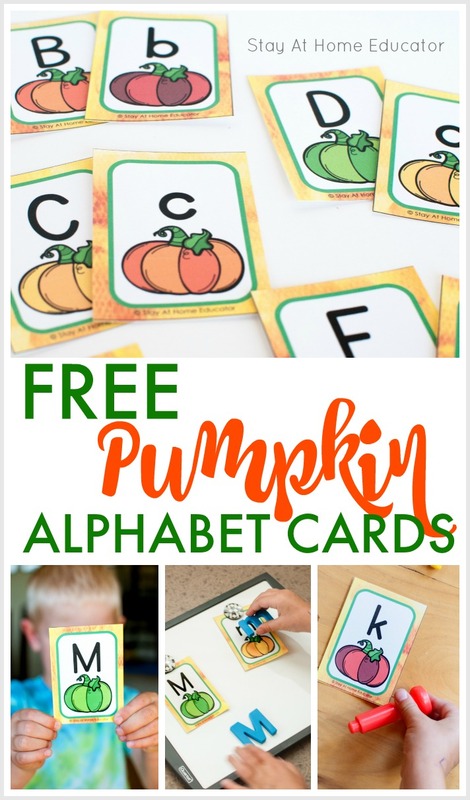 Who would have thought that some free pumpkin alphabet cards could get so much use?! Honestly, at the risk of them being over-loved by my boys. 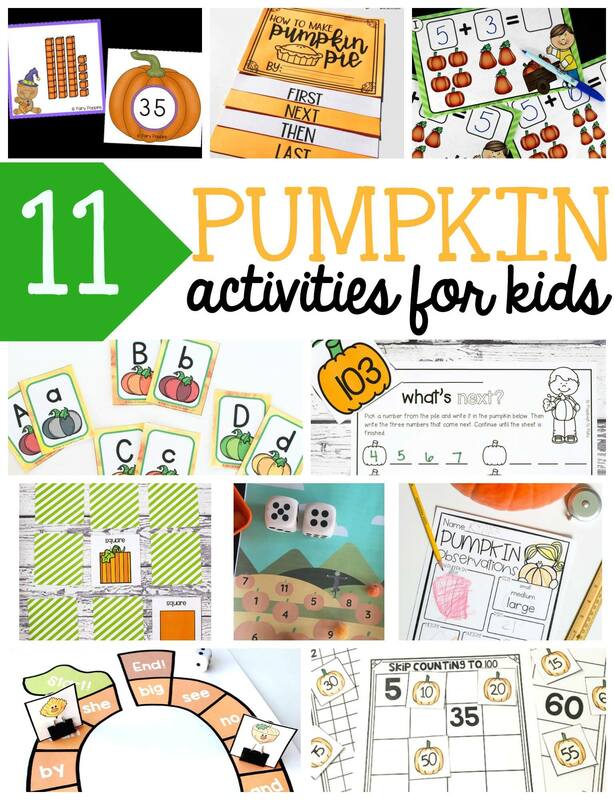 Looking for More Pumpkin Activities? 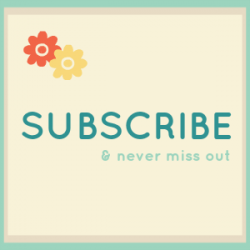 These brand new ideas will complete your lesson plans!